Famous for its industrial roots, rich musical heritage and football (amongst many other things) Manchester is one of the leading cities in the UK for innovation and startups. The city’s credentials are impressive. With a digital workforce of more than 62,000, Manchester is home to the largest number of digital professionals outside of London. With a digital turnover of £2.9bn and almost 900 startup births per year, Manchester features in the European Digital City Index for both startups and scale-ups, sitting in 16th and 17th places respectively. With the intention to boost the local economy through investment in innovation, transport, culture and skills, the proposal of a northern powerhouse aims to unite the towns, cities and rural communities in the North of England and Wales, with Manchester leading the charge. The digital and technology sectors have evolved significantly over the past five years. 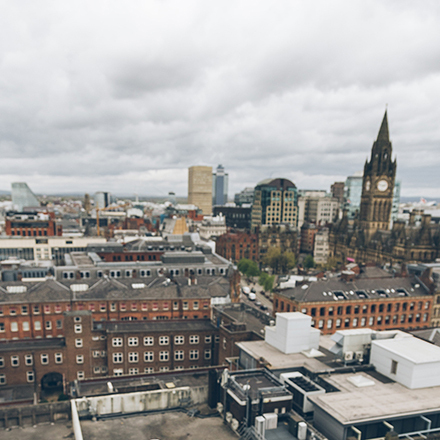 From community events to flexible workspaces, Manchester is an excellent place to call home. The average digital salary sits at £47,349, which is the eighth highest in the UK. 85% of local startups are positive about the growth potential of the digital sector. The latest figures demonstrate that digital and technology companies in the city have raised £200m in funding, cementing Manchester as one of the UK’s thriving tech hubs. Manchester’s leading universities have attracted many big businesses to the city, with talented graduates often eager to stay in the city often to create startups based on their research in higher education. This has given businesses easy access to forward-thinking individuals with a variety of skills that will drive innovation and growth long into the future. MediaCityUK is home to ITV Granada and now the BBC, drawing in top talent in the media and digital industries from all across the globe. Additionally, the central campus of the Manchester Science Partnership (MSP) houses more than 150 companies in a variety of fields including biotech, life sciences, ICT, health tech and the creative and digital sectors. Manchester’s creative economy is a rich pastiche of skills and disciplines, with many not digital in any way. In fact Manchester’s history as an economic powerhouse predates the digital revolution by hundreds of years. The city has for many years then, been home to a thriving independent arts and crafts industry. This is embodied by the city’s long history in manufacturing fabrics and textiles during the industrial revolution. Whilst the city’s startup economy is now dominated more by tech and digital, the arts and craft industry is booming. The craft beer industry is booming across much of Britain and Manchester is leading the way, with Indy Man Beer Con as well as other beer festivals, gaining huge popularity in the light of the success of London Craft Beer Festival. A new Creative Trade shopping centre in which craftspeople and makers from across the city will sell their wares has now got the go ahead too. The new artisan mall will become another string to Manchester’s bow, as one of the UK’s most attractive cities for the arts and crafts, whether solopreneurs or up and coming designer brands. If you can’t wait that long, then check out the Maker’s Market in Stevenson Square in the Northern Quarter, which runs every the first Sunday of the month, selling the goods and wares of makers, designers, producers, bakers, musicians and artists from all across the city. Manchester’s civic and business leaders have demonstrated a desire to ensure that the city has the opportunity to reach its true startup potential. Manchester Science Partnerships has announced a new tech incubator with a £2m investment from Manchester City Council. This will support startups in an array of industries including cybersecurity, artificial intelligence, cloud technologies, smart cities, data analytics, digital health and the internet of things over the next ten years. Additionally, the incubator will seek to connect different types of businesses and encourage collaboration to drive further innovation and growth for the local economy. Manchester’s mayor, Andy Burnham, has stated that he wants the city to be the leading tech and digital centre in the UK. To do this, he recognises that a comprehensive ecosystem must be established to support businesses at every stage, from startups and freelancers to the big hitters. The CityVerve project has received £10m of government funding to test Internet of Things (IoT) technology and explore how technology can be used to improve people’s lives. With an aim to build the world’s smartest city, everything from the environment to health care, culture and transport, the opportunities for a variety of new startups here are significant. The city is keen to nurture new businesses in every way possible. This includes financial support through direct investment and flexible loans. These financial assistance opportunities include the Greater Manchester Investment Fund and the North West Fund. Manchester is also gaining more attention from venture capitalists, who recognise that investing in new businesses in the North of England can deliver significant short and long-term results. There is a reason why Manchester has the UK’s second largest economy outside of London. The streets of the city are overflowing with centuries of history and inspiration. From the birth of mass manufacturing, steam power and the industrial revolution, Manchester can rightly be seen as the birthplace of the modern world. The city has also been home to some of the most influential thinkers, inventors and artists of the modern world as well. From Alan Turing to Oasis, the city has been at the forefront of cultural and technological innovation for over two centuries. This is still the case today and some key future-proofing strategies will certainly help secure Manchester’s reputation as a global capital of innovation, ingenuity and culture that will continue to attract the world’s top talent long into the future.